Looking to experience something new on your next vacation to Jamaica? Consider diving into the traditional Jamaican Maroon culture with the Charles Town Maroons in Portland! The Charles Town Maroons will welcome you into their living space and community where they will share stories of their history and culture. You learn about their Maroon ancestors and why they lived under the banner “freedom or death.” Hear stories of their struggles and ways of resistance and survival, including camouflage and guerilla warfare. In the museum, you can learn about Maroon politics, treaties and heroes, as well as touch artefacts from the days of slavery and compare them with things they still use today. 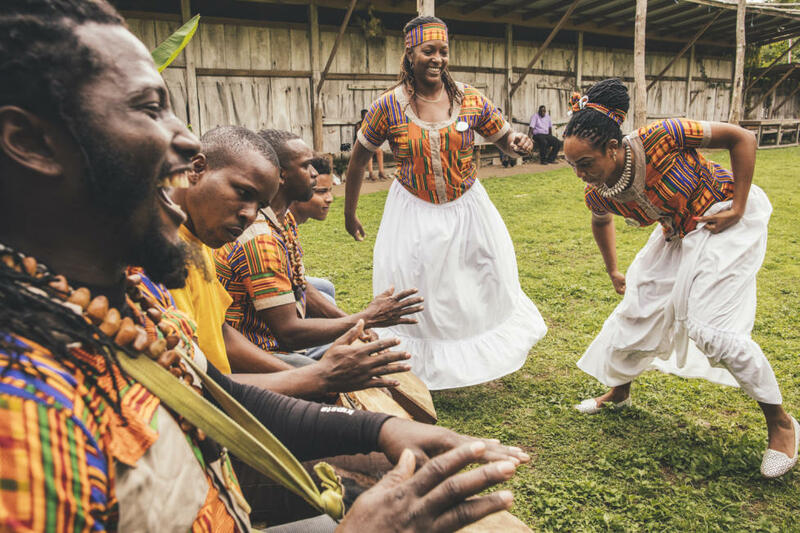 In the Sacred meeting space of the Asafu Yard, you will interact firsthand with Maroons and see how they express themselves through songs with drumming and dancing. You will be able to hear and touch the Abeng, a bugle-type instrument used for communication by Maroon warriors that is still used to summon community members today. Test your hand at playing the Gombeh drum and learn to dance the Kromante dance! Enjoy tasty authentic Maroon cuisine, such as from a calabash or gourd with a fresh juice beverage. Also, you can learn about their traditional herbs and healing rituals or take a guided hike in the surrounding rainforest. Whatever tour you take you will be sure to enjoy your experience with the Charles Town Maroons!